Whenever you message someone via chat, there’s usually a way to know if the other person read what you sent. It’s a pity the same doesn’t apply to emails. It’s so easy to deny having received anything or using the spam inbox as an excuse. It would be nice being able to add a “double check” feature to your emails. To be certain the other person received your message, opened it, and if they downloaded the attached file if any. And what if you could also know how many times the message was opened, when, and from which IP addresses? You can know all of that using Safe Stamper Notify. 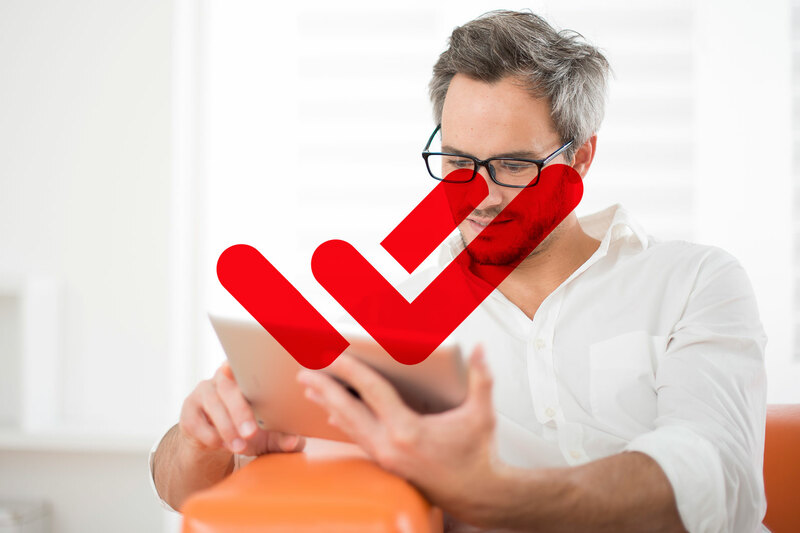 In other words, in case you’re familiar with our certification services already: Safe Stamper Notify is the suspicious sibling of Safe Stamper Mail. Mail serves to certify the exact date and hour of the sending of an email, including its content, recipients… Notify not only certifies that, but also every time the message is opened, the attached file is downloaded, which days, at what times, and from which IPs. 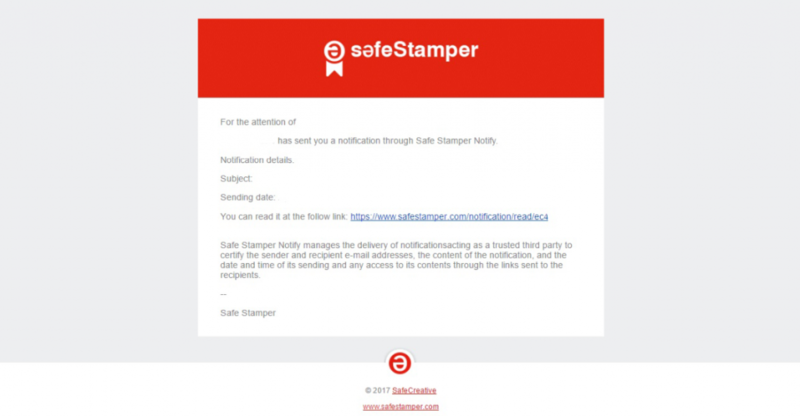 How does Safe Stamper Notify work? Safe Stamper Notify funciona como tercero de confianza para certificar la entrega de mensajes, el contenido del mensaje, cuándo ha sido enviado, y cuándo ha sido abierto. Para hacerlo, nosotros enviamos un correo oficial a los destinatarios de tu notificación con un enlace. Si quieren leer todo el texto y descargar el fichero adjunto, en caso de que lo haya, hay que hacer click en el enlace. Eso y que tanto mensaje como fichero adjunto se encuentran en Safe Stamper permite saber en todo momento quién accede y cuándo. Our Notifications are not like any regular email. You don’t send them from your regular email service, but from Safe Stamper itself. Just log in, click on “CERTIFY” (the red button) and click on the “Notifications” icon. You’ll find a form with several fields to fill. First, the recipient’s email address and name. You can click on + in order to add more recipients; each one will cost you one certification credit. Next, you have fields to write the subject and the message, and the option to attach one file if you need. All recipients will receive an email from Safe Stamper, informing them of your message. They won’t be able to read the full text nor the attached file yet, only that the message is from you, and the subject line. We encourage you to write a very clear and specific subject line, in order to avoid miscommunications or the possibility of your message passing unnoticed by the recipients. The email includes a link to Safe Stamper, to access the full content of the notification, and a brief explanatory text on what’s Safe Stamper Notify. In order to know if they opened your message, go to “My Certificates” and click on “Notifications”. 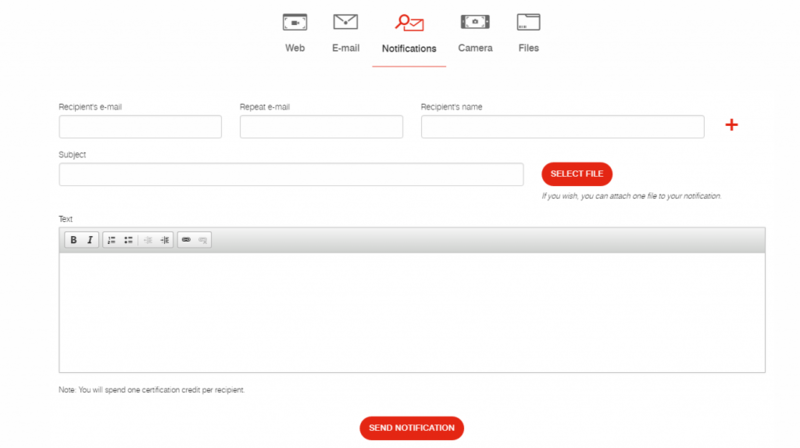 There you’ll find a list of all your sent notifications, with information about when you sent them and their current status. Click on the magnifying glass icon to “View details” and know precisely everything that’s been done on your notification. If you’re interested, you can also learn how Safe Stamper Mail works. We hope this tool will be useful to you. Please don’t doubt to send us a message if you have any thoughts regarding these services. You’ll find us on Twitter and Facebook. Stay Safe!